As you may already be aware, G-III has an interest in Karl Lagerfeld. The interest goes beyond the typical licensing agreement. They actually have acquired a minority stake in the Karl Lagerfeld parent company. June 08, 2015 G-III Apparel Group, Ltd. and Karl Lagerfeld Group BV, the parent company of the Karl Lagerfeld global brand, announced that they have entered into a joint venture agreement for the development of the iconic designer’s namesake brand in the North American market. 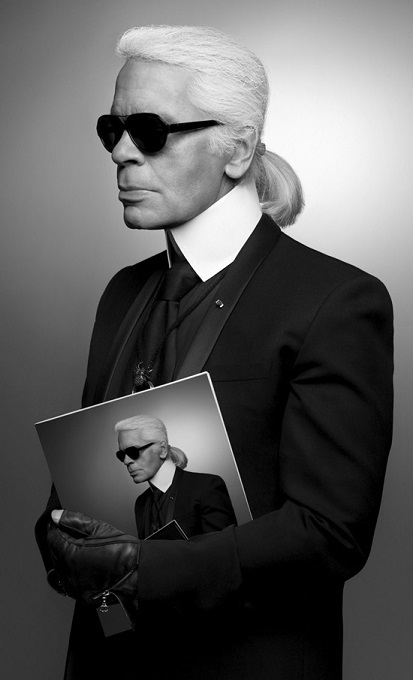 Under the terms of the agreement, Karl Lagerfeld Group BV has assigned the Karl Lagerfeld marks for all consumer products (except eyewear, fragrance, cosmetics, watches, jewelry, and hospitality services, all of which remain exclusively with Karl Lagerfeld Group BV) and apparel in the United States and Canada. In addition, the joint venture will be granted an exclusive, irrevocable, royalty-free license to use the marks in Mexico with respect to the same products. G-III acquired a 49% interest in the joint venture. G-III is also the first licensee of the joint venture and has been granted a five year license (with two renewals of five years each) for women’s apparel, women’s handbags, and men’s outerwear. The joint venture expects to grant additional category licenses over time to G-III and/or to other parties. This month G-III Apparel Group, Ltd. strengthened the companies partnership with the Karl Lagerfeld brand through the minority investment in the Lagerfeld parent company. February 25, 2016: G-III Apparel Group, Ltd. (NasdaqGS:GIII) and the parent company of the KARL LAGERFELD brand announced that G-III has taken a 19% minority stake in the parent company. This investment will strengthen the partnership between G-III and the KARL LAGERFELD brand and extend their business development opportunities on a global scale. Additional terms of the deal were not disclosed. This investment is in addition to G-III’s ownership of a 49% interest in the North American joint venture that holds rights to the KARL LAGERFELD trademarks for consumer products (with certain exceptions) and apparel in the United States, Canada and Mexico. G-III is also the licensee of the joint venture for KARL LAGERFELD women’s apparel, women’s handbags and men’s outerwear. G-III is a leading manufacturer and distributor of outerwear, dresses, sportswear, swimwear, women's suits, women's performance wear, footwear, luggage, women's handbags, small leather goods and cold weather accessories under licensed brands, owned brands and private label brands. G-III sells swimwear, resort wear, and related accessories under its own Vilebrequin brand. G-III also sells outerwear and performance wear under its own Andrew Marc and Marc New York brands, and has licensed these brands to select third parties in certain product categories. G-III has fashion licenses under the Calvin Klein, Tommy Hilfiger, Karl Lagerfeld, Kenneth Cole, Cole Haan, Guess?, Jones New York, Jessica Simpson, Vince Camuto, Ivanka Trump, Ellen Tracy, Kensie, Levi's and Dockers brands. Through its team sports business, G-III has licenses with the National Football League, National Basketball Association, Major League Baseball, National Hockey League, Touch by Alyssa Milano and more than 100 U.S. colleges and universities. Other owned brands include Bass, G.H. Bass, G-III Sports by Carl Banks, Eliza J, Black Rivet and Jessica Howard. G-III also operates retail stores under the Wilsons Leather, Bass, G.H. Bass & Co., Vilebrequin and Calvin Klein Performance names. Learn more about the financials of G-III Apparel Group in the financial section here on Apparel Search.